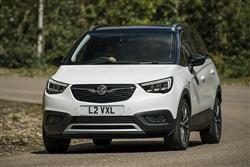 Vauxhall is getting serious about every area of the small SUV sector. 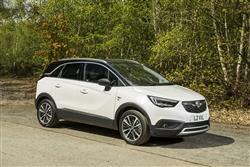 Proof of that is delivered by this, its smallest offering, the Crossland X. It's compact yet surprisingly spacious, as well as being fashionable to look at and efficient to run. There's no pretence at off road capability but in all the areas that really matter, this car looks to be a strong proposition. Here's a very fashionable little Vauxhall, the Crossland X. It's a smartly turned-out, family-orientated compact SUV that claims to be perfectly pitched for its target market. 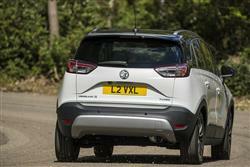 It slots in just below the Mokka X model in Vauxhall's SUV line-up. 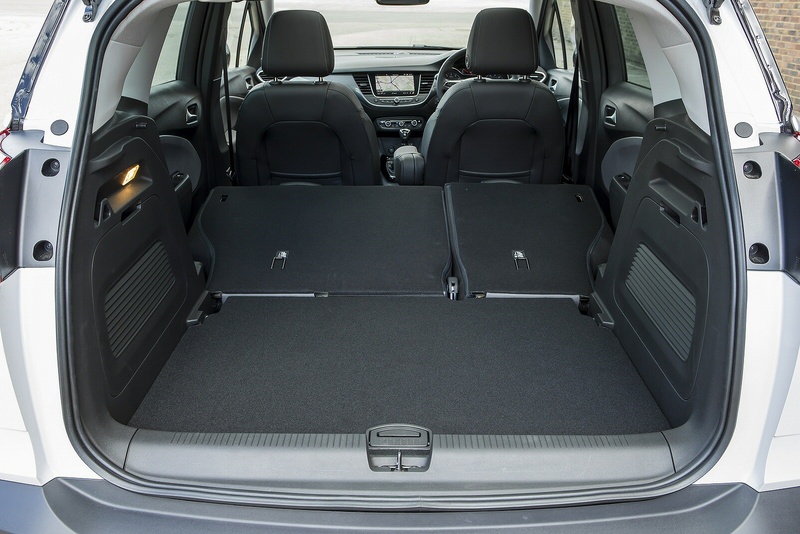 Here's a car with enough space inside to comfortably function as an ideal family second car, yet one that can also slot into the tightest supermarket space. Under the skin, it shares an upgraded version of the platform that underpins a rival Peugeot 2008, plus it gets almost everything from that Gallic model's engine line-up, which means a range of 1.2-litre petrol engines and a couple of 1.6-litre diesels. Vauxhall has built upon the French formula though, with a little of the style that marks out its fashionable ADAM citycar - hence, for example, the fashionable contrast-colour roof. Plus the brand has added in nearly all the advantages of its clever 'OnStar' personal connectivity and service assistant set-up. It all sounds quite promising doesn't it? We took one to Norfolk for the weekend to try it. Thanks to its Peugeot-derived platform and light PSA Group engines, this Crossland X has a huge weight advantage over its Mokka X showroom stablemate - around 200kgs - and you really feel that the first time you turn into a bend with any sort of real speed. Don't get us wrong: this Vauxhall isn't any sort of driver's car, but it's certainly a lot more agile and chuckable than you might expect, something we experienced for ourselves on the undulating Norfolk roads we came across as part of our weekend family test drive. Engine-wise, Crossland X buyers are offered a PSA-sourced range of three cylinder 1.2-litre petrol powerplants, plus that French group's 1.5-litre diesel developing 102PS. If budget is everything, there's a price-leading normally aspirated 83PS petrol unit, but easily the best option in the line-up is the mid-range 1.2-litre 110PS turbo petrol powerplant that most likely buyers will choose. It's the only engine on offer with the option of an automatic transmission, but this gearbox makes quite a dent in the efficiency figures. If you need more power, then your Vauxhall dealer will steer you towards the 1.2-litre 130PS model we tried as part of our test. Buyers in the smallest SUV segment tend to prioritise aesthetics more than those in larger Crossover categories, so with that in mind, it's safe to say that this Crossland X starts off with something of a head-start. Provided you choose a variant with this contrast-coloured roof, there's something of the sophisticated, personalised feel here that you get with the Griffin brand's trendy little ADAM citycar. Inside, the centrepiece of the smartly styled dash is a beautifully-integrated Intellilink infotainment screen which incorporates the usual DAB stereo, Bluetooth 'phone and informational functions. 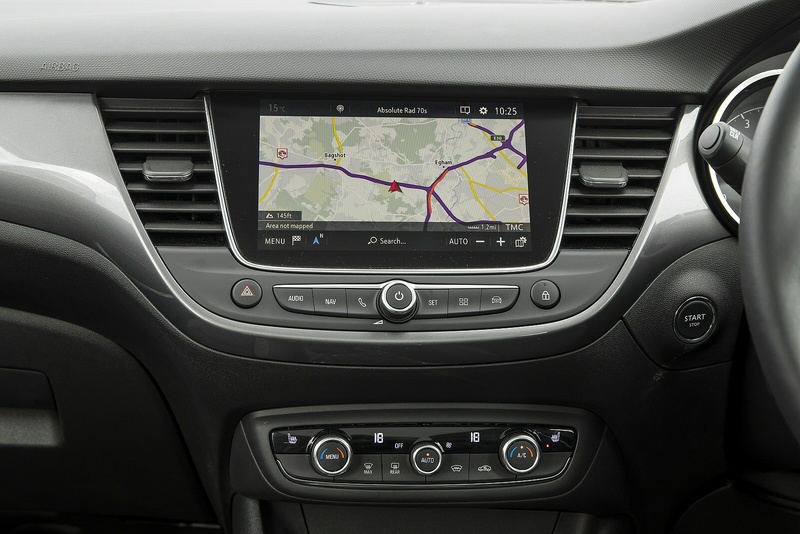 Include the optional satellite navigation system and the screen size increases from 7 to 8-inches and you'll be better set up to use this car's other key technical innovation, the OnStar 'personal connectivity and service assistant'. 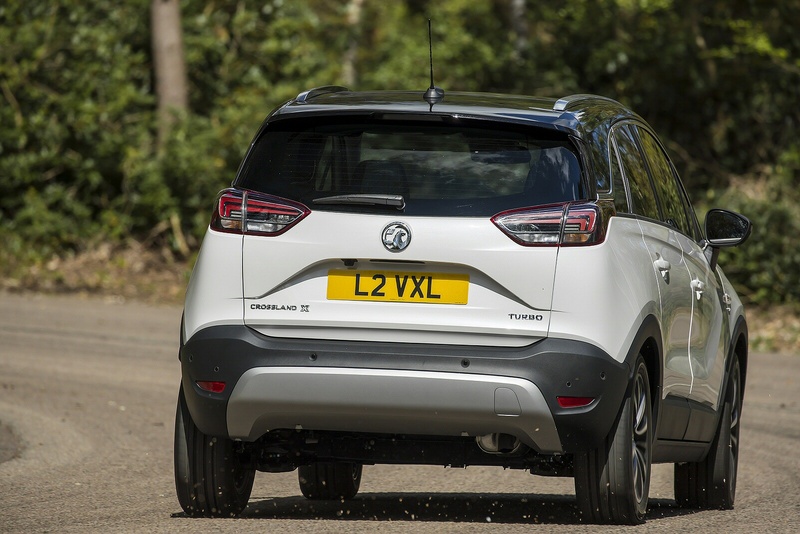 This includes a vehicle tracking system in case of theft, creates in your Crossland X an in-car wi-fi hotspot and will allow you to monitor key vehicle information via a downloadable 'MyVauxhall' smartphone app. 'OnStar' will also automatically alert the emergency services if the airbags deploy. 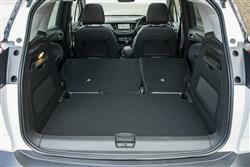 In the back, there's the useful option of a sliding rear bench, behind which lies a 410-litre boot. This proved to be large enough for my family's weekend luggage and is accessed through a decently-sized rectangular aperture. 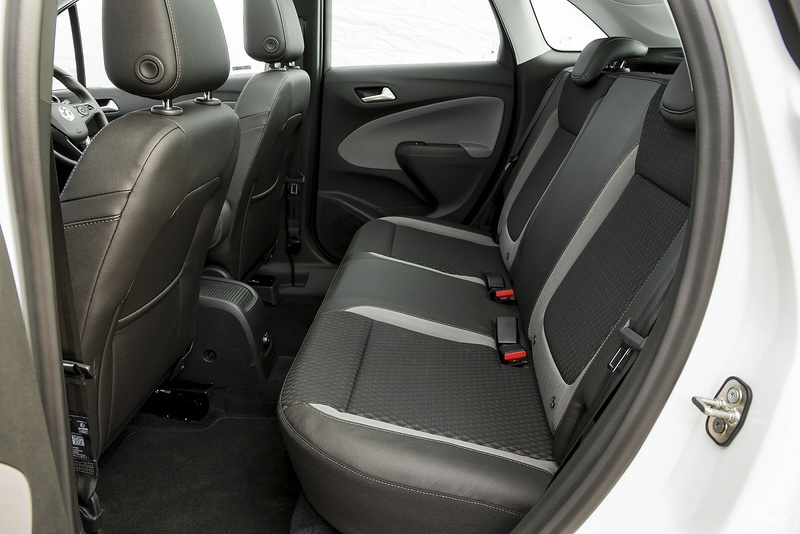 Push forward the backrest and up to 1,255-litres of fairly flat space is opened up. 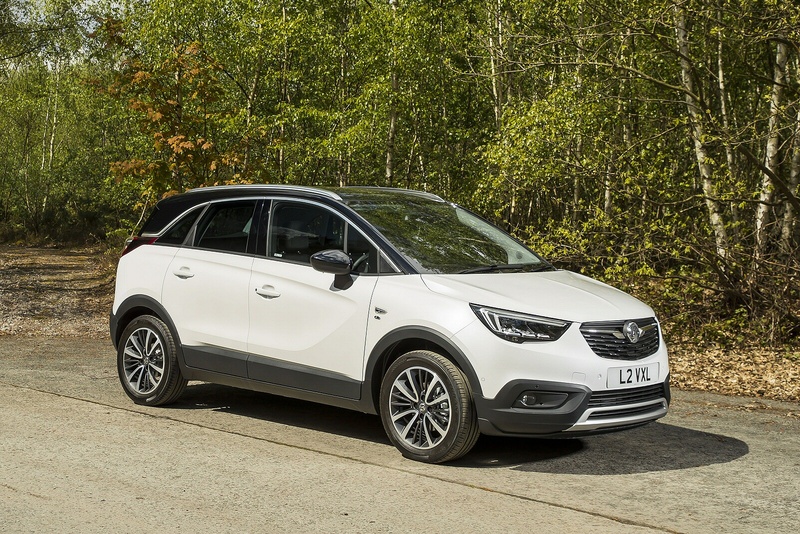 Prices start at just over £17,000 and Vauxhall reckons that over 65% of sales of this car will be to private buyers, a much higher percentage than with its Corsa or Mokka X models. Hence perhaps, the emphasis on petrol power in the line-up, all the green pump-fuelled engines being 1.2-litre three cylinder units. If at all possible, try and avoid the entry-level normally aspirated 83PS variant and find the extra that Vauxhall asks for the pokier yet more efficient turbocharged version of this powerplant. A premium of around £1,300 over the base engine gets you a Crossland X 1.2 Turbo with 110PS and a 5-speed manual gearbox. Stretch to mid-range 'Tech Line Nav' trim, then find a further £600 or so on top of that, you can get yourself the same unit with 130PS and a 6-speed stick shift - which is what we tried. What else might you need to know? Possibly the fact that if you stick with the 110PS petrol model, there's the option of 6-speed automatic transmission - for an extra £1,160. As for diesel power, well we'd question whether you really need it, given the relatively small annual mileages likely to be covered by this kind of car. If you really are set on black pump motoring, then you'll need a budget starting from just under £19,500 for the 1.5-litre 102PS 'BlueInjection' diesel. Finally, we need to mention that, like many cars in the SUV 'B' segment, this one can't be ordered with any kind of 4WD system. 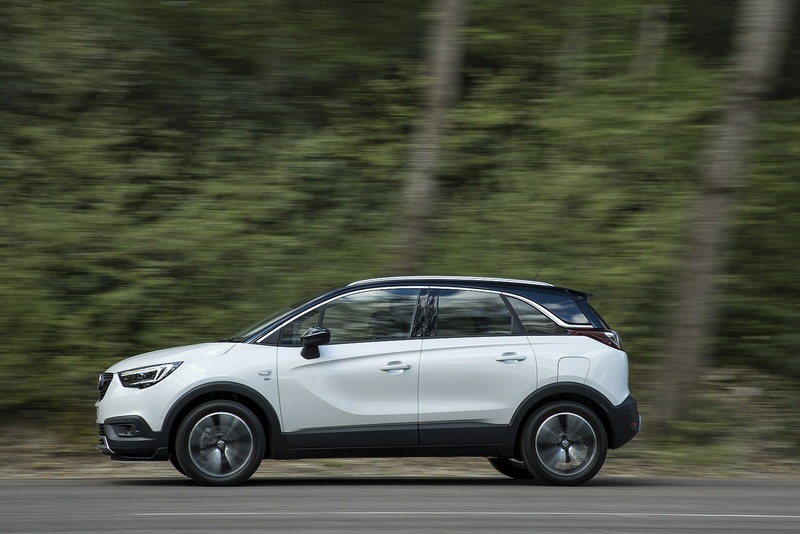 This Crossland X is fully 200kgs lighter than its Mokka X showroom stablemate, which essentially is comparable to the kind of weight saving you'd make if you asked your entire family to get out and walk. Plus it gets PSA Group petrol engine technology which sees all the green pump-fuelled Crossland X models being powered by a three cylinder 1.2-litre powerplant that's vastly cleaner and more frugal than anything we've ever previously seen in a petrol-engined Vauxhall SUV. Let's get to the figures. The 1.2 Turbo 110PS Crossland X variant that most customers will buy delivers 58.9mpg on the combined cycle and 109g/km of CO2 in manual form with 16-inch wheels, returns that are genuinely difficult to beat in this segment. A rival Nissan Juke 1.2 DIG-T looks almost recklessly extravagant by comparison, delivering 49.6mpg and 128g/km. There's not too much of a running cost penalty for upgrading yourself into the 130PS version of the 1.2-litre turbo engine. That's the variant we tried on our weekend test, which manages 54.3mpg and 117g/km of CO2. Go for the 1.5-litre diesel option and you'll find the 102PS variant able to deliver 70.6mpg on the combined cycle and 105g/km of CO2. If you�re looking for a new Vauxhall Crossland X 1.5 Turbo D ecoTec  SE 5dr [Start Stop] Diesel Hatchback for sale, you�ve come to the right place. At Bristol Street Motors we don�t just have the best Vauxhall Crossland X 1.5 Turbo D ecoTec  SE 5dr [Start Stop] Diesel Hatchback deals, we also offer friendly advice and help with all your enquiries to ensure your buying experience is a happy experience.